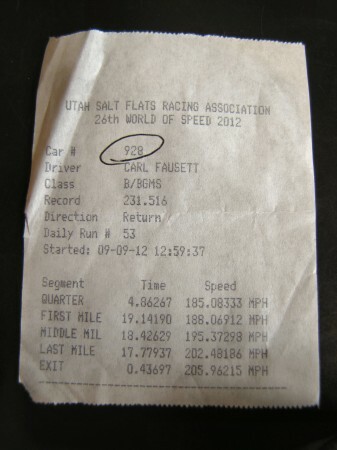 When Carl Fausett and team arrived at Bonneville this year in an attempt to break the world record they set last year, they were met by a course that was quite literally below water. A heavy rain had poured on the area the Saturday before leaving large and deep pools of salt infused water. Imagine driving your beloved Porsche through salt brine like that! Still, Carl had hopes it would be better elsewhere, and they cautiously proceeded. Watching the faces of other drivers you could just see the scowl on every one of them as they drove down into the salt bath. Fortunately, the paddock area was a little higher than the course entrance leaving it free of standing water. Carl’s team set up their pit area and rolled out their speed prepared Porsche 928. The salt here was soft and clumpy, sticking to everything. Look at the tires and tire tracks in these pictures. Carl’s team scores a rookie tech inspector who takes his time and meticulously examines everything on the Porsche. From years of experience Carl knows to stand back, shut up, and speak only when spoken to during inspection. A little more than an hour later the Porsche is cleared through and it’s off to get fuel. For the gas class, all competitors must run gasoline supplied at the event and then seal the filler neck on the tank. The idea is to keep things fair and assure that no one is getting an extra boost from doctored fuel. After Tech, teams are allowed to drive the course in their support vehicles. Similar to a road racer walking, biking or jogging the track, this gives drivers the chance to see course conditions and know what’s in store for them. Perhaps more importantly, in this type of event, the crew gets to see the course. Otherwise, they would never get a chance to see it and set-up is that much harder! 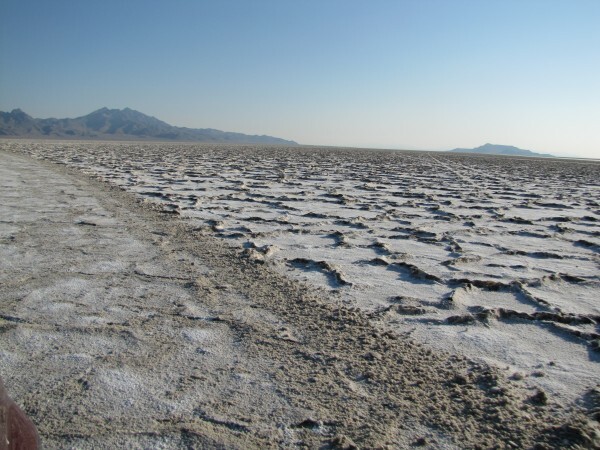 Although flat, Bonneville is anything but smooth. Note the size of that pothole! The photo above and the two below illustrate the differences in the course over the various sections. This is mile 3. The end of the 4th mile. Note the bumps! This is the turn-out lane cars drive on after their run. The “Breakers” on the right are on both sides of the course. You sure don’t want to go through there! When Carl ran this event last year, he started with the rear spoiler down, and raised it as needed to get traction. This year the team decides to do the opposite. Starting with the rear spoiler high, they will lower it on each subsequent run, getting dialed in as they go. Carl's crew pushes him to the starting position where he waits for the starter to give permission to enter the course. It’s unclear if it is the wet salt, extra ballast or the new rear spoiler, but unlike last year, tire slip isn't a problem. Waiting for the signal to go. Grip is strong and Carl's Porsche 928 goes faster on its second run and is sneaking up on the 231.5 MPH record they are after. Speed ramps up fast and he will quickly fade from site. There were eleven cars in front of Carl that had already turned one qualifying run with speeds above their current class record. Now they were lined up for their 2nd run, and if it too was over the current record, then the record was theirs. Unfortunately, 5 of those cars blew engines in their attempt – and between course clean-up and parts/debris sweeping Carl's wait was lo-o-o-ng. Carl's wait for his 3rd run ended up taking more than 3 hours! 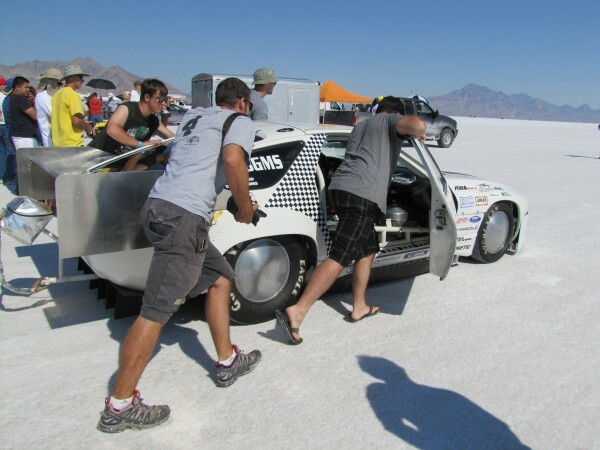 As a side note, blown engines at Bonneville are fairly common. Running full-throttle at full load for 5 minutes is hard enough on engines, but given that many competitors close off their radiators to save aero, these engines get HOT! Also, some race engine builders will build their engine “loose” (like a 100,000 mile motor) to combat internal friction and get every last HP out of them, but they don’t last long, and sometimes – not long enough. 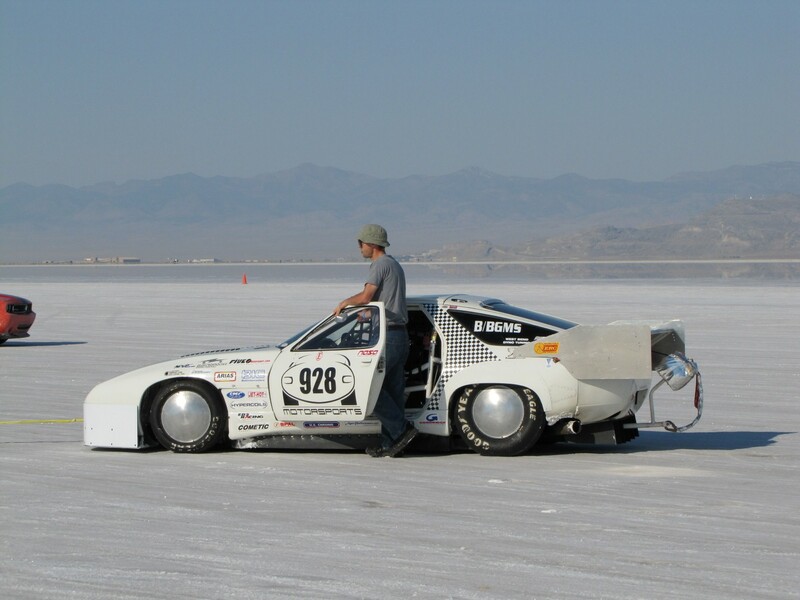 “The run went as I had become accustomed to: the car gets very squirrely on the defects in the salt surface from 120 to 160 MPH, then the ground effects start to work and the car settles down and becomes stable. Steering wheel corrections become micro-sized. At mile 3, a push of wind moved the whole car from the right side of the course to the left before it blew itself out – I was helpless on the loose salt to do anything about it. It stopped before pushing me off the course and I was still in the throttle. Others were not so lucky. Carl exits his 928 and stands near the driver’s door drinking a bottle of water he had snuck along inside the car. Looking over he takes note of a wisp of black smoke coming out one of the hood louvers on the right side. A few seconds later the wisp increases to a steady stream from two louvers. It's a fire! There’s no doubt at this point (steam is white and this was black)– but Carl pauses hoping it might be self-extinguishing. If he pulls the fire bottle release – their year at Bonneville would likely be over, and as Carl said, “I wasn’t done yet! I remember having a ‘conversation’ with my car at this time: "Really?” I said. “we’re going to burn now?” The answer came in the black smoke coming out of the 3rd and fourth louvers…. This was not a self-extinguishing type of fire. Reluctantly, Carl reaches in and pulls the release on the engine fire suppression system. The smoke changes from black to white to gone in just seconds. The system worked! Ten pounds of FE-36 sprays for 90 seconds from two different nozzles: one aimed at the headers and one at the rear aimed at the fuel cell. At this point the crew arrives and Carl fills them in on what happened. The tow strap is hooked up, and they pull the 928 to the pits. Once the car is in the air it doesn’t take long to find the origin of the fire. It's the ballistic nylon bell housing blanket, a scatter-shield in case the flywheel or clutch explodes during the run. The nylon had melted and ignited on the metal heat shields that were holding it off the headers. “There is something ironic about a piece of safety equipment that causes an unsafe condition”, said Carl. To continue racing, they need to find someone who could fill their fire bottle or lend a spare (possible, but difficult on a Sunday in the desert); and they would need to find another ballistic bell-housing blanket (like the one above). Unfortunately, this is an impossible task as their blanket is custom made. To add insult to injury one entire bank of injector wiring is melted together. The team makes lunch, relaxes and continues swapping options and ideas (like running with the fire bottle in place but empty and no bell housing blanket). They are sure if they did succeed at breaking the record under these conditions, they would be stripped of their achievement during what would surely be a failed impound inspection. Breaking the rules is bad. Perhaps more importantly, breaking safety rules is REALLY BAD. The idea is quickly dropped. "It was hard to be turned away after all the work we’d done, the wind-tunnel testing, the fabrication, the two-year build, and the 3000 mile drive to-and-from this event. Especially when the car was running so well, and we were climbing up the numbers as planned," remarked Carl. Carl wants to thank his crew and mentioned that, "three of these goofballs have already signed on for next year, so it looks like we’ll be back." So will PorschePurist. The article above was adapted from an email conversation and write-up with Carl Fausett. Carl owns and operates 928 Motorsports, LLC, manufacturer of performance products for the 928 and 968 lines of Porsches. Please visit them at www.928motorsports.com.